Go MINI Night Challenge Raceway to try out. My original plan was to build the track when the little one is asleep and Finn is at school so he will come home to the Surprise but it didn’t go all by plan so i ended up with 2 over exiting children trying to help me build the track which obviously took a little while longer then i anticipated! 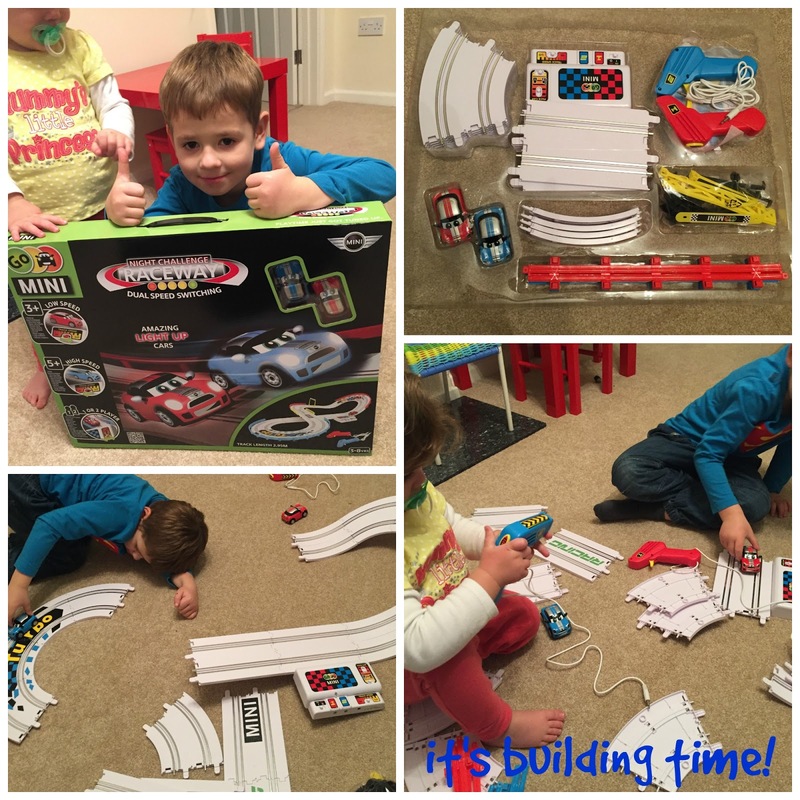 It was simple enough to follow the instructions and put the track pieces together (the above picture which you can find on the back of the box too did help as well) not so simply to keep my children off the track and letting me get on with assembling. It all went well till i realised there wasn’t a single screwdriver in the house (and yes i am married to a electrician who took them all to work with him) so we had to wait till daddy come home so we could put the batteries in and finally have a race together! The exciting Dual Speed Switching technology allows parents to choose the right level of driving ability for their children. Select ‘low’ speed for younger racers and the car will never leave the track, so no crashes and no frustration! For the older drivers switch to ‘high’ speed for an added turbo boost and watch as the cars zoom around the bends. the speed of which can also be controlled. For ultra-cool street action the underside of the cars glow as they race around in the dark. With this amazing track set, no racing adventure is too big, or too fast! thought it was more fun to take the car on and off the racetrack. or on its own in peace without his little sister trying to grab the cars off. to see the cars light up whilst racing! This is defiantly a great racetrack for any car mad kid out there and would make the perfect Christmas present under the tree this year! 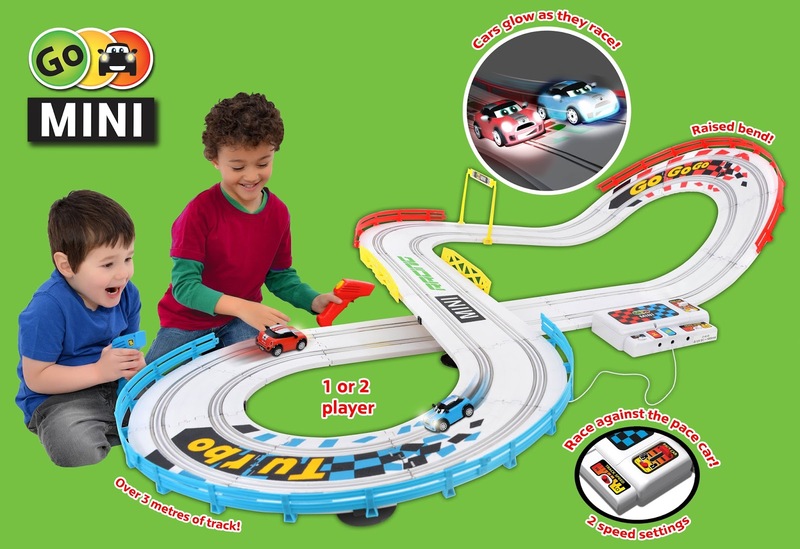 The Go MINI Night Challenge Raceway is suitable for children age 3 years and over and needs 8 AA Batteries (who are not included) and it has a RPP of £49.99 and you can purchase it here. Disclaimer: I have been send the Go MINI Night Challenge Raceway from Golden Bear for reviewing purposes, but all thoughts and opinions are mine.